Note - User accounts are not applicable to SNMP v1 and v2c because communities are used to control access. Then click Management Access > SNMP. Click the Users link to expand the SNMP Settings page and display SNMP Users. To add an SNMP user, click Add. The Add SNMP User dialog box appears. The Edit SNMP User Information dialog box appears. If you are adding a user, type a user name in the User Name text field; otherwise proceed to the next step. The user name can include up to 35 characters. It must start with an alphabetic character and cannot contain spaces. In the Authentication Protocol drop-down list, select either Message Digest 5 (MD5) or Secure Hash Algorithm (SHA). In the Authentication Password text field, type a password. In the Confirm Password text field, retype the authentication password. In the Permissions drop-down list, select read-only (ro) or read-write (rw). In the Privacy Protocol list box, select DES (Digital Encryption Standard) or AES (Advanced Encryption Standard). Note - The AES privacy protocol option is available only for SNMPv3 as of ILOM 3.0.16. In the Privacy Password text box, type a password for the privacy algorithm specified in Step 12a. The privacy password is case-sensitive and must contain 8 to 16 characters, with no colons or space characters. Note - The privacy password is only required if you selected DES or AES in Step 12a. In the Confirm Password field, retype the privacy password to ensure that it matches the privacy password specified in Step 12b. 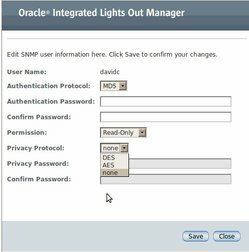 Click Save to apply the SNMP user account properties.